These ultra-absorbent, reusable cloths feature a unique new weave and are constructed from 50% recycled materials. They are the perfect replacement for paper towels as they quickly pick up spills and messes. Where to use: In the kitchen, bathroom – actually anywhere! How to use: Wet and wring out before use. Maintenance: Rinse thoroughly and wring out well after each use, ensuring all detergent and food particles are rinsed from cloth. They contain the Norwex BacLock micro silver agent, allowing them to self-purify and inhibit bacterial odour, mould and/or mildew growth within the cloth. 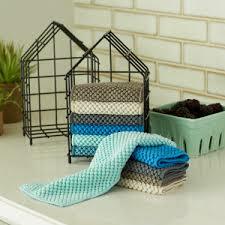 You can buy the Norwex Counter Cloths online from me, in Australia. Or you can buy them in New Zealand here. If you are elsewhere, check Norwex.com to find a consultant in your country. ← Norwex Online Clearance, 35% off with FREE shipping! !